When the sensation and condition of our muscles change, this is due to physiological changes within the circulatory and nervous system in our body These systems are very sensitive and are designed to respond instantly to any changes imposed on the body, internal or external Since they consist of blood vessels and nerves which are everywhere in the body we can get to them and have an impact on them by working for the outside, as well as by working with processes within the body. What is Muscles Pain ? Muscle pain is usually not a sign that there is something violent or destructive going on in our muscles On the other hand, pain is a result of messages aboutsubstance imbalance being conveyed between the nerves and the brain. To find the source of the pain in your muscles you must look at the waste products- waste left over from muscles work when nutrients from the blood, are used up Waste products are continuously produced and washed out by blood circulations as we move or exercise For example, a muscle suddenly put to hard work might lead the fibres to produce waste products faster, than blood circulation could provide new nutrients Similarly in case of obstruction, the waste products being produced might not be washed out, effectively Therefore, pain is the net result of either lack of oxygen or waste product overflow. 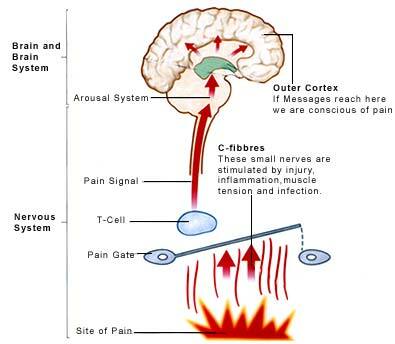 Thus muscles pain is usually not a signs that there is something violent or destructive going on in our muscles Rather, pain in a result of the massages about substances imbalance being conveyed between, the nerves and the brain This definition may sound too simplistic, for something that really hurts yet, this is the basic mechanism for the sensation of muscles pain.